How Does Severance & Vacation Pay Affect Unemployment? When you are laid off from a job and receive a severance package, it can impact your unemployment benefits. Severance is typically a lump-sum or regular payment given to employees by some companies when they terminate employment. Generally speaking, employers are not legally required to give severance pay, even after a layoff. However, many choose to do so to maintain goodwill among departing employees. As a recently laid-off employee, you’d probably be pretty glad to learn that your soon-to-be former employer offered a severance package. However, it’s important to know how severance works, in order to reduce the chances of financial surprises down the road. It’s not exactly the same as receiving your regular paycheck. For example, you’ll need to pay taxes on your severance, whether you receive it in a lump sum or at regular intervals, just as you pay taxes on your standard paycheck. Taxes on severance may be higher, depending on the method your employer chooses to determine your pay. Depending on where you live, receiving severance might impact your unemployment, reducing or delaying your potential payout. Different states have different policies regarding severance, and whether your pay will affect unemployment benefits depends on state law. For example, receiving severance pay does not impact your benefits in California, even if you receive it in a lump sum instead of in regular installments like a paycheck. You need to report the amount you receive, and pay taxes on it as you would any other income, but it will not be deducted from your unemployment compensation. In New York, if you continue to receive the exact same benefits you received while working, you would not be eligible for unemployment – in most cases. You might be eligible to claim unemployment benefits if your weekly severance pay is less than the maximum weekly unemployment insurance rate. In Texas, severance may delay or stop receipt of unemployment benefits, and payments will be delayed until the payment's period of coverage has expired. Unemployed workers in Florida are not entitled to unemployment compensation for any week that the severance pay is equal to or greater than the weekly benefit. If severance is lower than unemployment, you would be paid the difference. Because state laws and individual circumstances vary, check with your state department of labor for the rules that determine if you qualify. 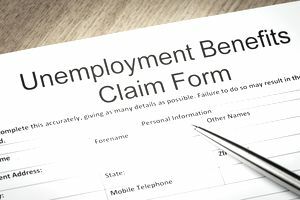 Even if severance is not deducted from unemployment benefits, you are required to report it when you file a claim. Similar to severance pay, pay in lieu of notice is wages paid to an employee who was laid off without notice when the employer was required to provide advance notification of a lay-off. When you receive pay for any unused vacation or flexible leave benefits upon leaving your job, it may impact your unemployment benefits. State regulations regarding how vacation pay will impact unemployment benefits vary. Check with the unemployment office for your state to get the definitive answer for your location. In some states, lump-sum payments for vacation time awarded at termination will not decrease benefits. When employees receive ongoing payments for vacation while they are unemployed, those payments will often reduce their unemployment checks. However, some states allow all workers without a set date for resuming employment to obtain full benefits while receiving vacation pay. When states do reduce benefits, some deduct the full amount from unemployment awards while others will reduce payments by a percentage of the vacation pay. Some states allow a certain amount of vacation pay or other income before reducing benefits dollar for dollar. Laid-off employees with a set date to go back to work who use vacation pay during their period of unemployment will usually have their benefits reduced. Because laws vary from state to state, it's important to check with your state unemployment office for how severance pay will be handled. You may find the information you need online, or you will be able to find a phone number to call for assistance. Don't wait to apply for benefits even if you're not sure about your current eligibility. Get your claim in the system so you can receive the maximum benefits you are eligible for. Report your severance pay when you file the claim, and your unemployment compensation will be calculated for you. Also, if you're a member of a union or covered by another type of employment agreement, check with your business office for assistance with unemployment benefits. If your unemployment claim is denied by the state unemployment department or contested by your employer, you have the right to appeal the denial of your unemployment claim.